Patrick McCarthy of Roth Mobot and RubberMonkey.com was super kind to share his awesome Leap Pad glitch with everyone. 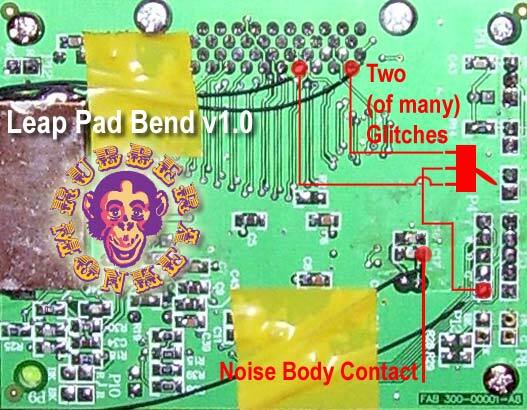 It is quite often that these Leap Frog Pads get passed up for fear of not being able to be circuit bent, however Patrick has managed to find the sweet spot as detailed in the schematic. The resulting glitches are very stable and create a nice stream of digital noise reminiscent of a Speak and Spell and can only be described as Wet. Have a listen to A Brief History of United States as performed by Patrick on the pad, while triggering the glitch at specific points during the course of the history. Nice work, can’t wait to try it with my Leap Frog Pad. Also for those in Chicago on Dec 1st, Patrick will be doing a workshop at the Old Town School of Folk Music. The class appears to be full, but its worth the try and RSVP in case someone backs out or to be the first inline for the next one. Enjoy yourselves.